Thelma Joyce Montsma, age 78, of Kentwood, went into the loving arms of Jesus on Monday, August 27, 2018. Her struggle with cancer is now over. Thelma was born on February 9, 1940 in Racine, WI to Carl and Anne Talsma. She was the oldest of four children. Thelma married Theodore (Ted) Montsma on August 21, 1959 at the Racine Christian Reformed Church in Racine, WI. Thelma was a homemaker and had a heart for service. 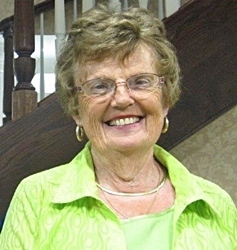 She was the ultimate volunteer, serving anywhere needed at the Delavan Christian Reformed Church and Delavan Christian School. Ted and Thelma enjoyed their retirement years in Wisconsin and Florida. Highlights were special vacations for just the two of them and several with the entire family. In 2014, they moved to Grand Rapids, MI (Holland Home). Thelma is preceded in death by her husband, Theodore (58 years). She is survived by four sons: Thomas (Susan) Montsma of Hudsonville, MI., Timothy (Marjorie) Montsma of Byron Center, MI., Donald (Jill) Montsma of Darien, WI., and Steve (Stephanie) Montsma of Cutlerville, MI; 13 grandchildren: Tom (Cory, Carly, Kirstin, Kurtis), Tim (Serena, Trent), Don (Kasey, Adam, Alex) and Steve (Austin, Cole, Brody, Wes); three brothers: George (Kathy) Talsma, James (Kathy) Talsma and Carl Jr. (Kelly) Talsma. Funeral Services will be held at the Breton Terrace (Holland Home), Centre Place, 2500 Breton Woods Drive SE, Grand Rapids, MI 49512 on Saturday, September 1, 2018 at 2 pm. Visitation will be on Friday, August 31 from 4:30 – 7 pm at Stroo Funeral Home, 1095 68th Street SE, Grand Rapids, MI 49508, and one hour prior to the funeral. Donations can be made to the Christian school of your choice: Unity Christian High School, South Christian High School or the Delavan Christian School. We extend our sincere condolences to Thelma’s entire family. In this sad time may you find strength from our Heavenly Father’s promise that we can be reunited with our loved ones by means of a future resurrection on a paradise earth where sickness and death will be no more. - John 6:40; Psalms 37:10,11 What a wonderful day this will be! May this precious hope that awaits us and your cherished memories of Thelma bring you a measure of comfort now and in the days ahead.